I was walking by the Newman Gallery the other day and what to my surprise? as it hung in my bedroom for a couple of years, at least! Can you spot which piece it is? ~ by Dawn Elliott on September 9, 2013. I would say it’s the metal heart to the right. 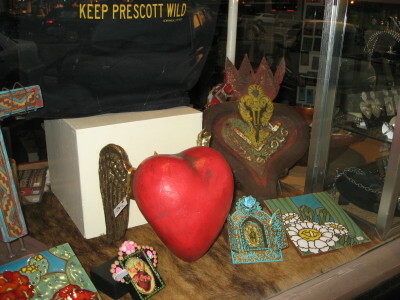 The large red heart with wings doesn’t look like your work. In any event they are all great. Hope you enjoyed your walk.